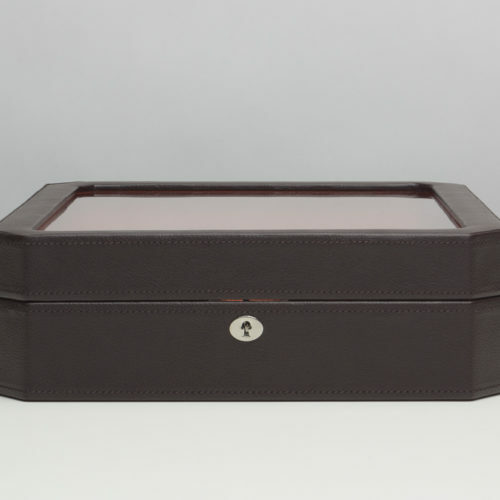 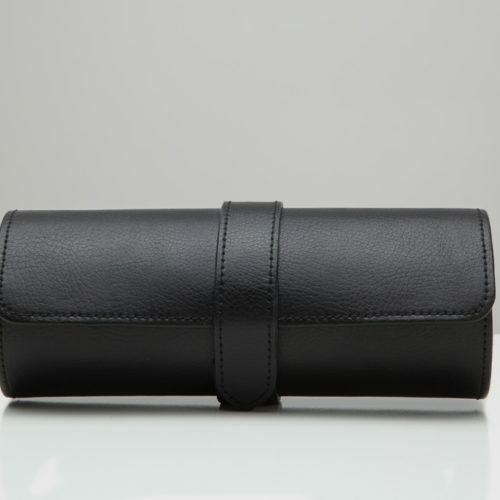 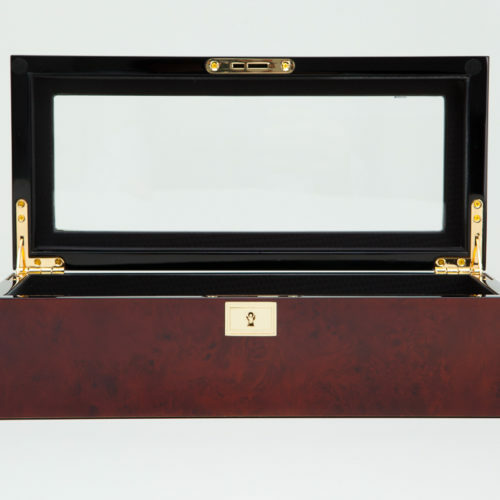 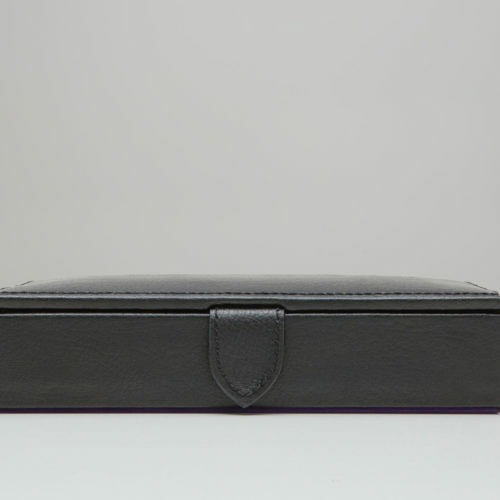 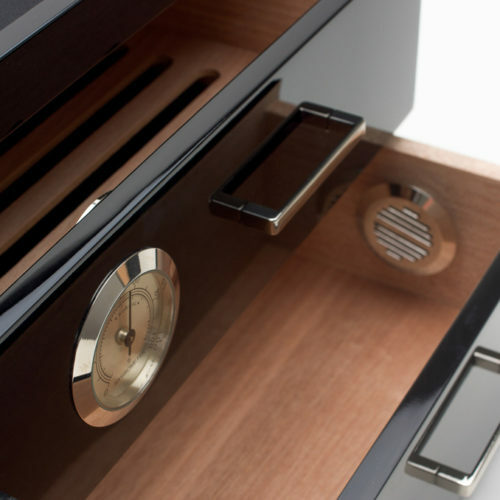 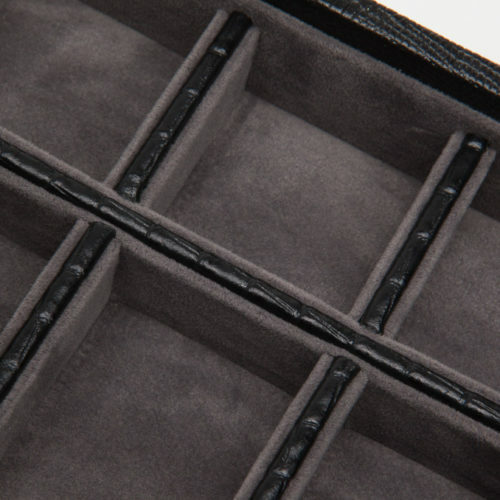 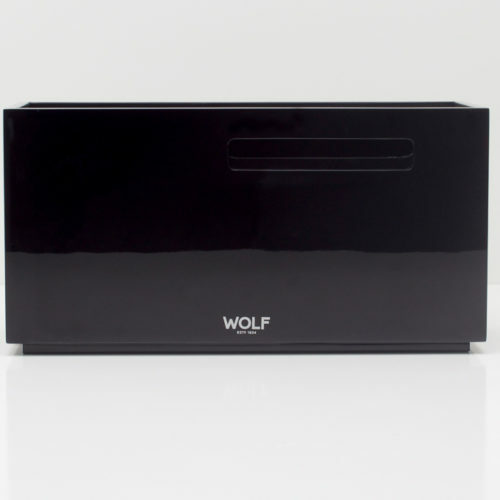 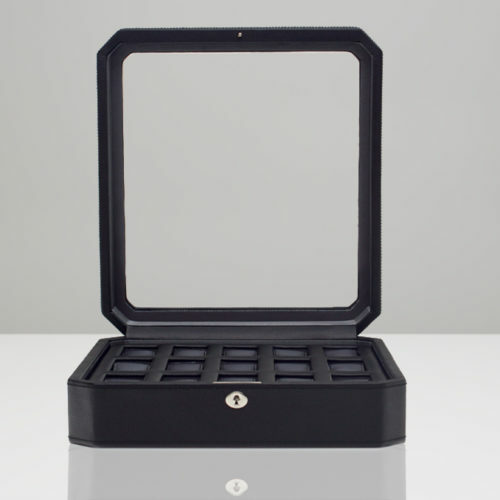 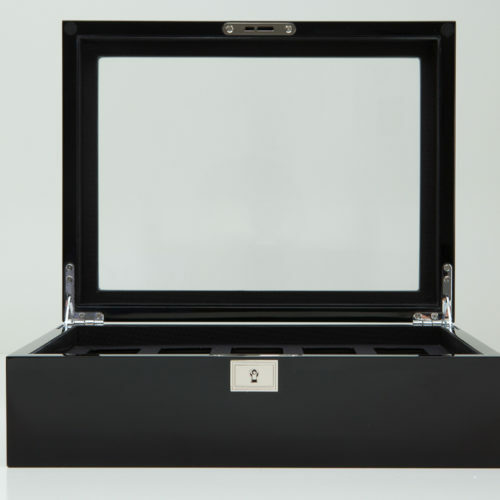 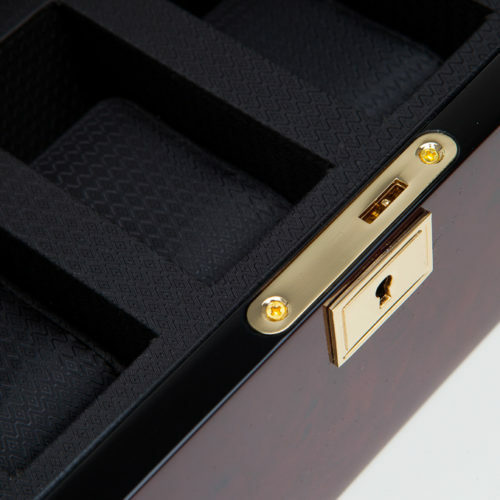 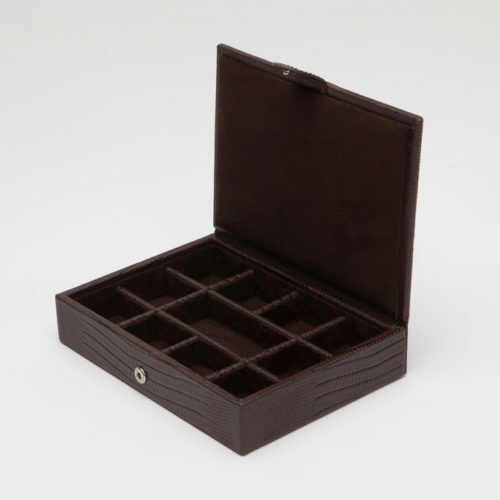 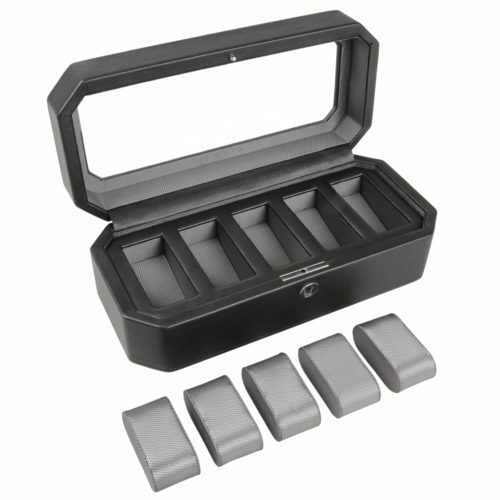 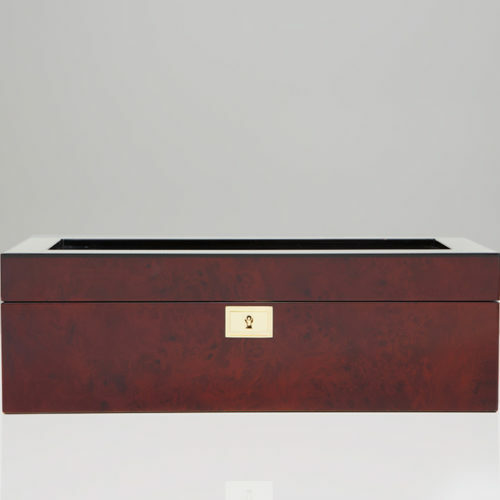 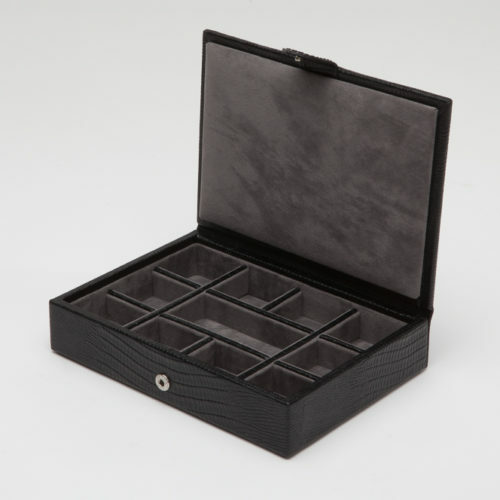 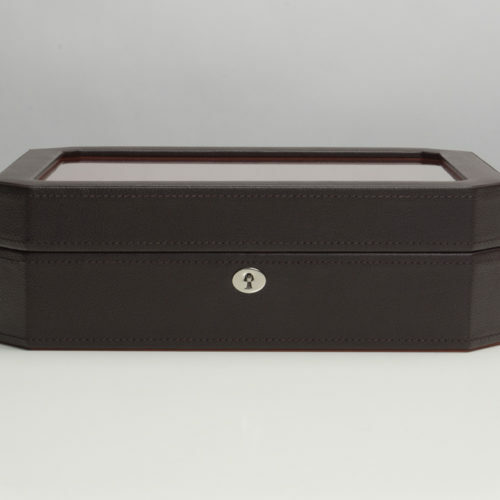 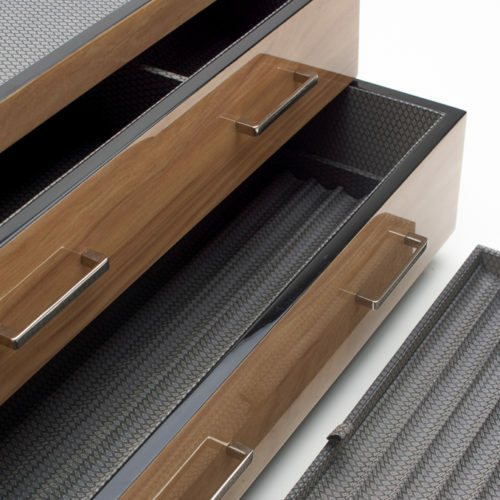 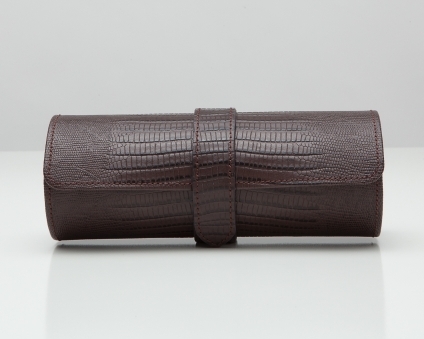 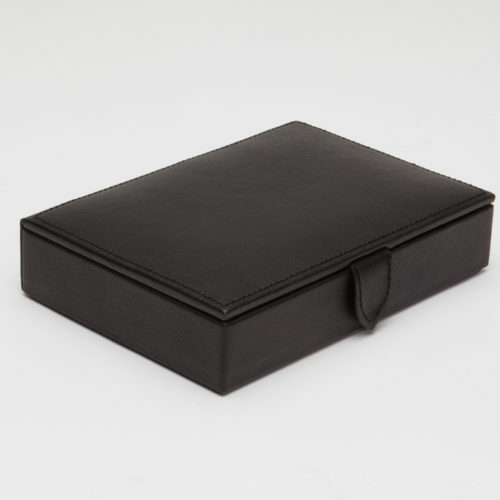 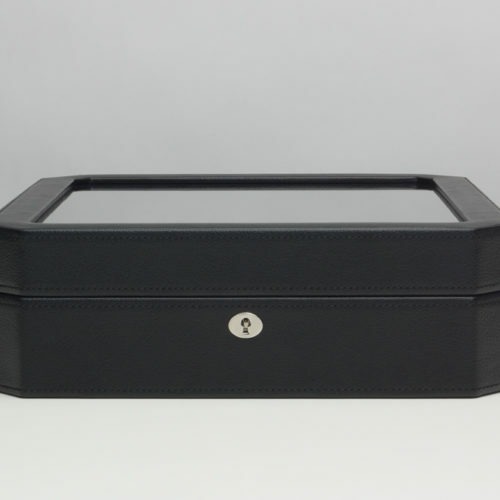 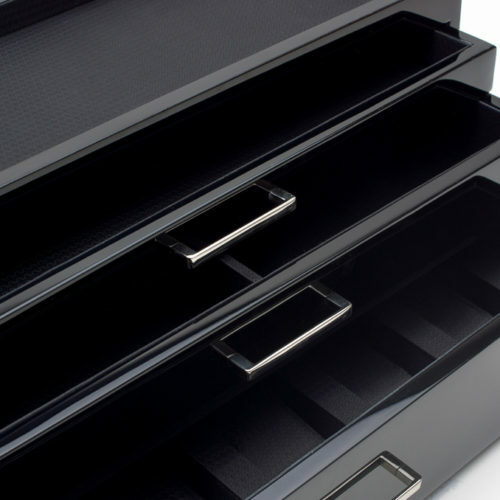 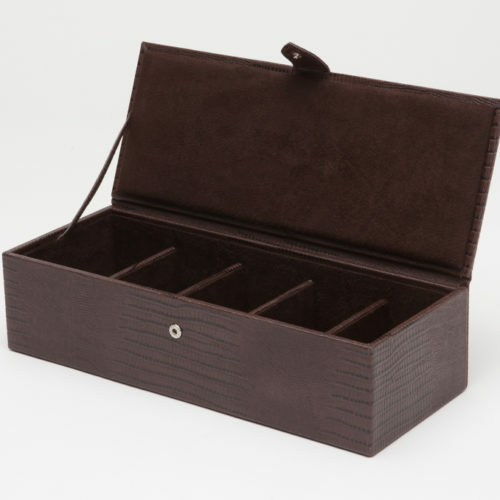 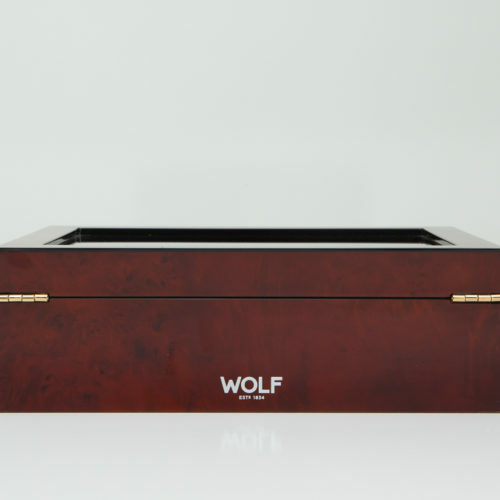 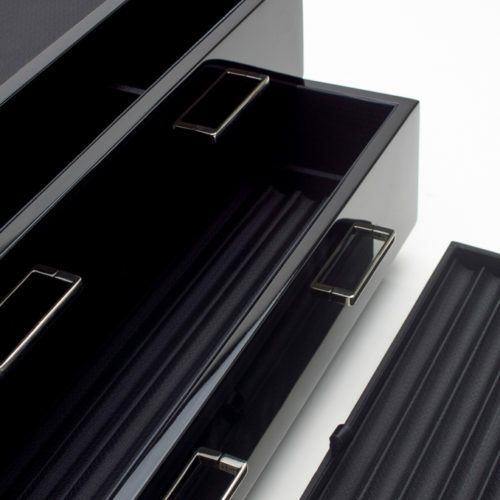 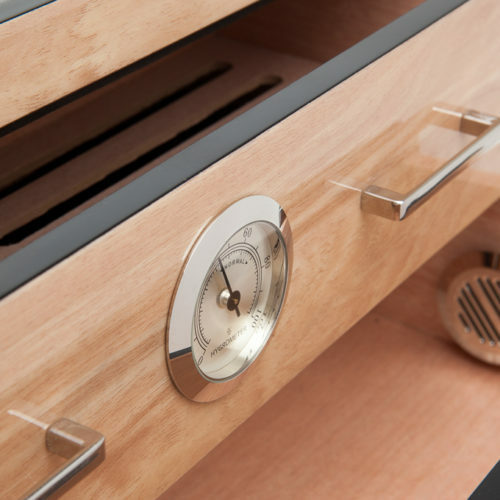 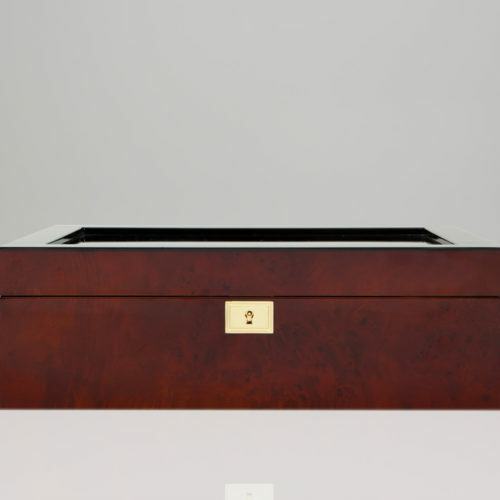 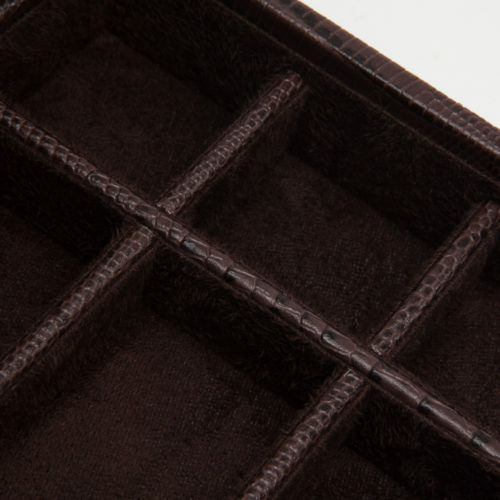 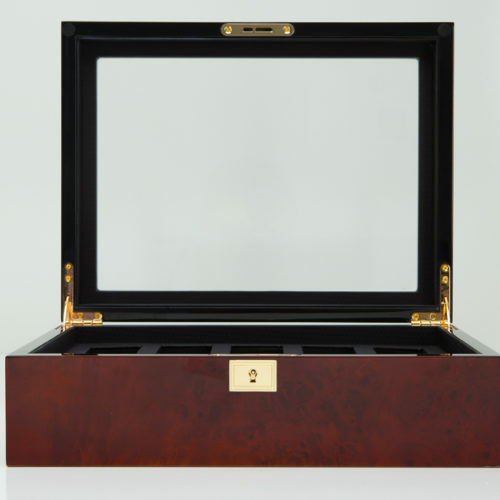 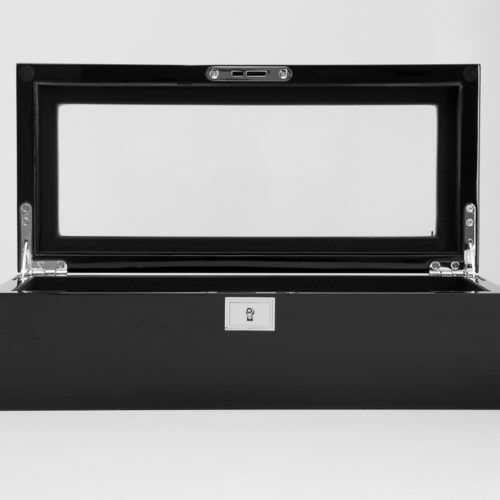 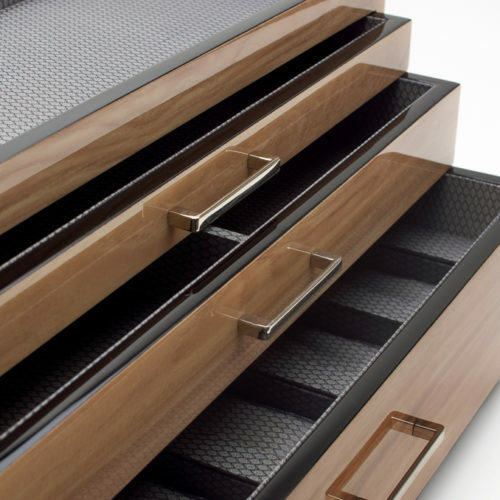 Discover our line of valet cases, watch boxes, cufflink boxes, and other solutions for storing coins, jewellery, cell phones, and other small accessories for men. 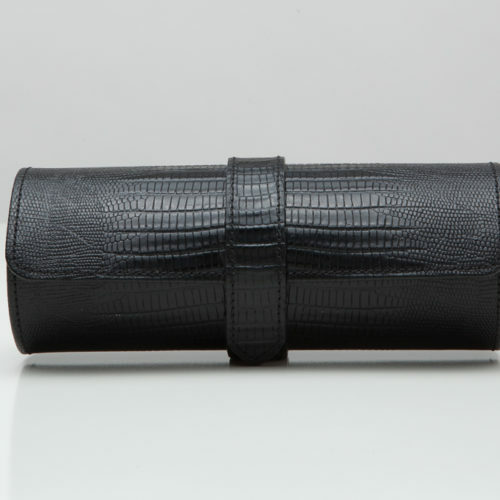 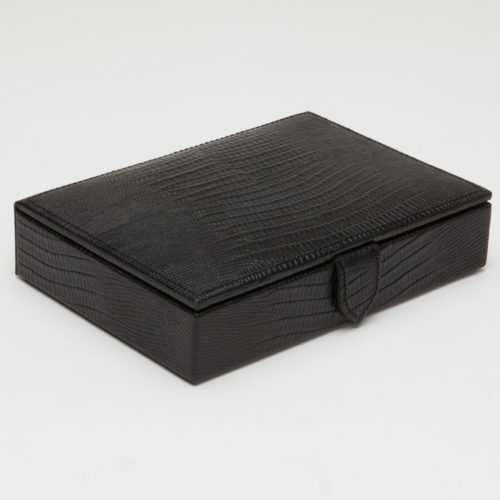 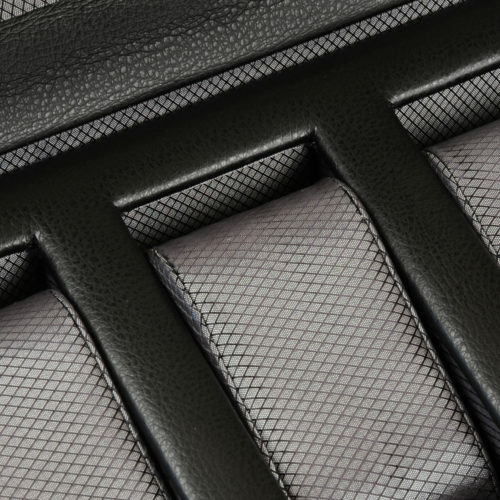 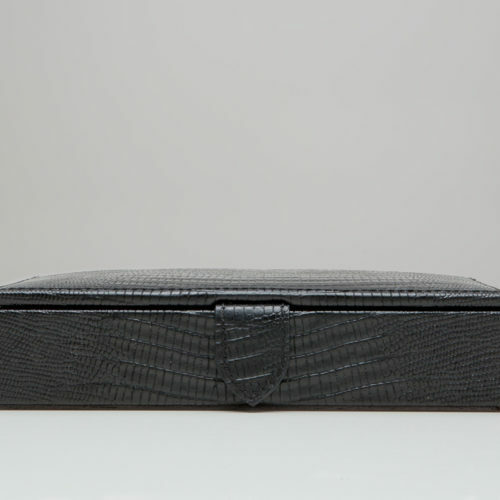 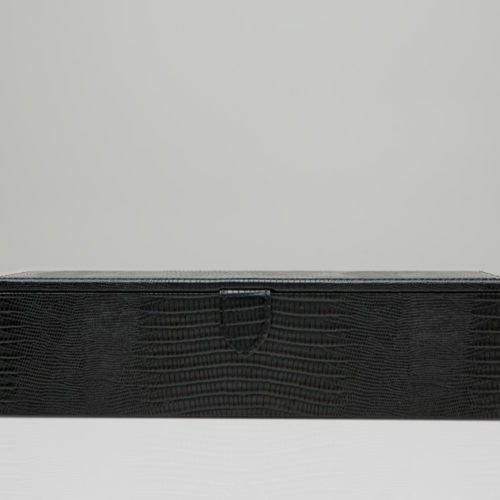 The Blake cufflink box, in black Teju lizard embossed leather, incorporates a classic gentleman’s travel necessity with a bit of flair. 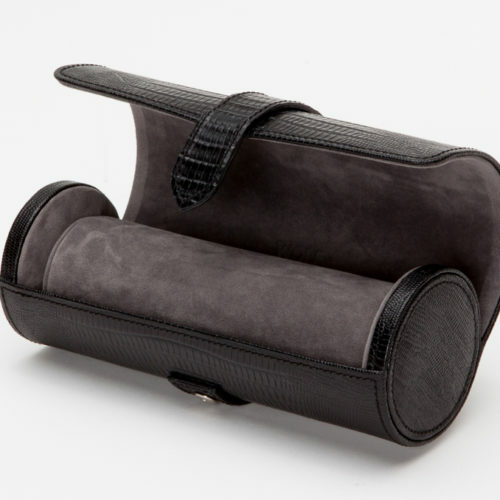 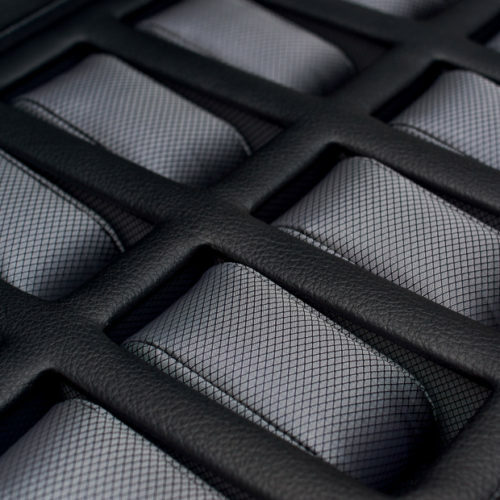 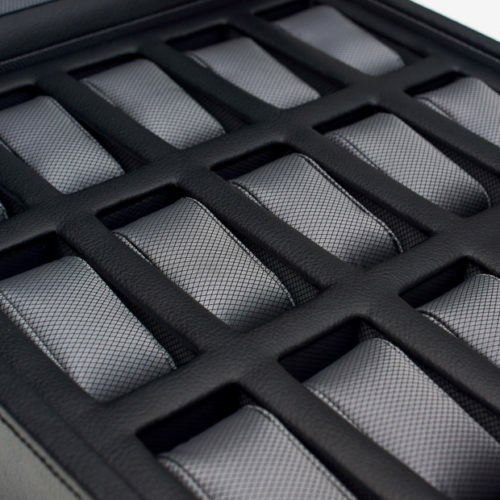 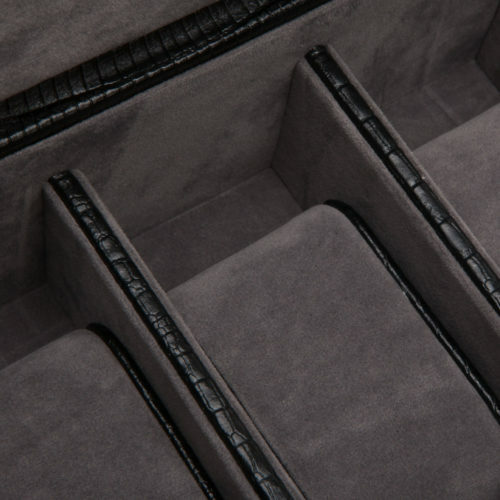 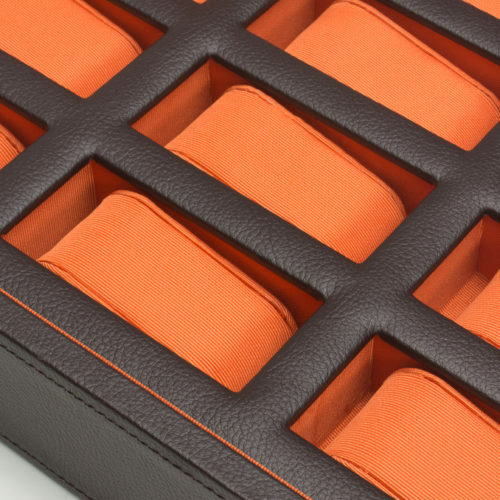 Includes grey ultrasuede, snap closure, 10 cufflink compartments and 1 collar stay compartment. 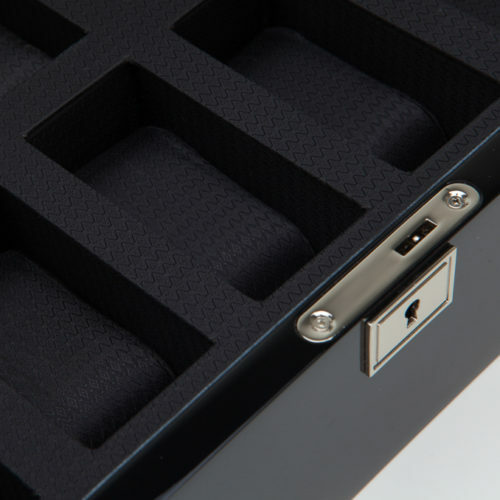 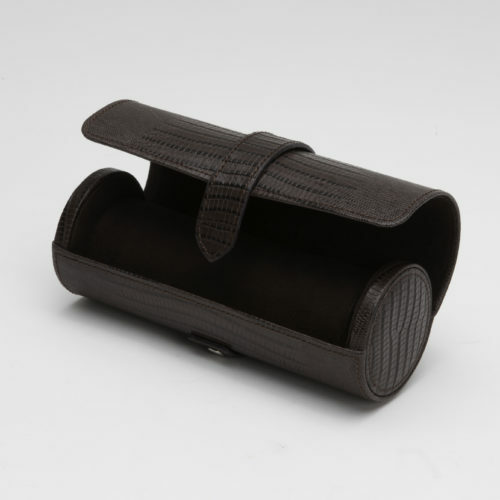 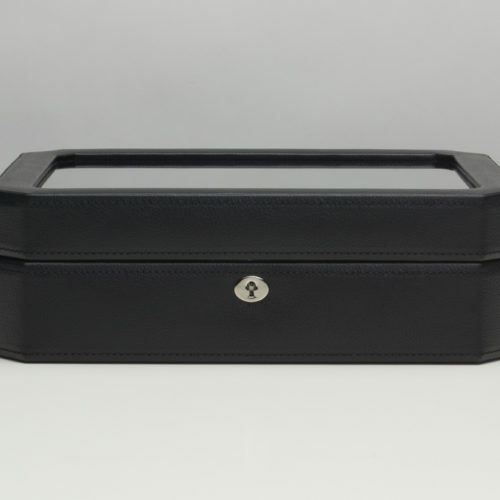 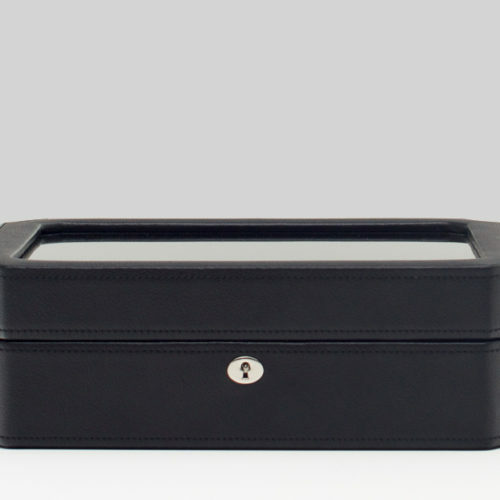 The Blake cufflink box, in black pebble leather, incorporates a classic gentleman’s travel necessity with a bit of flair. 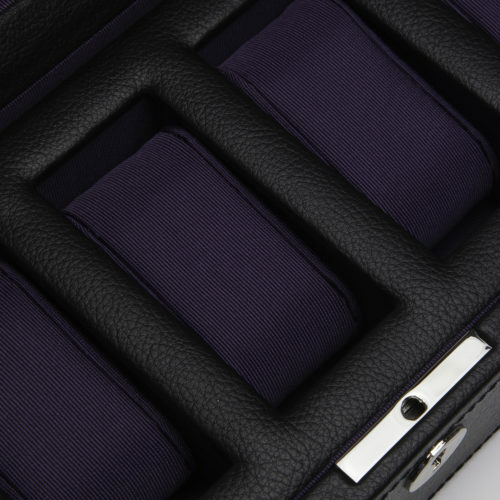 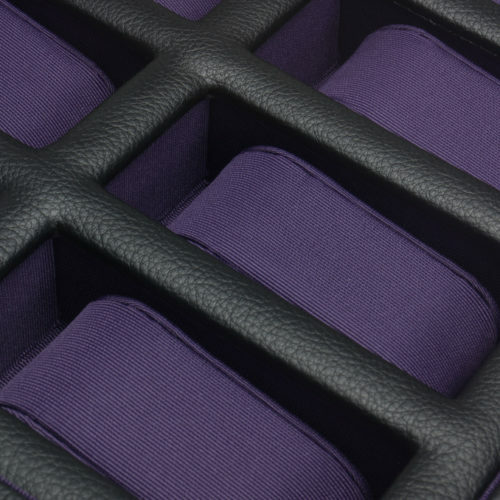 Includes purple ultrasuede lining, snap closure, 10 cufflink compartments and 1 collar stay compartment. 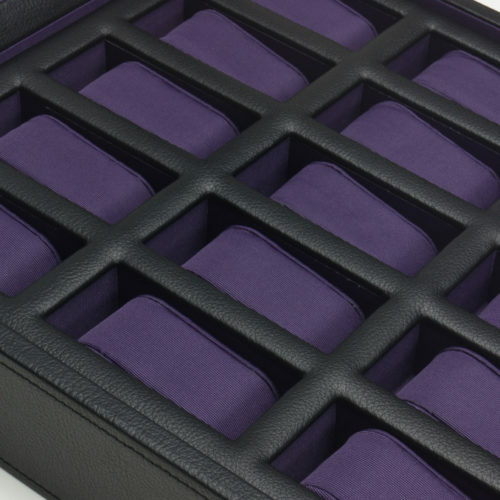 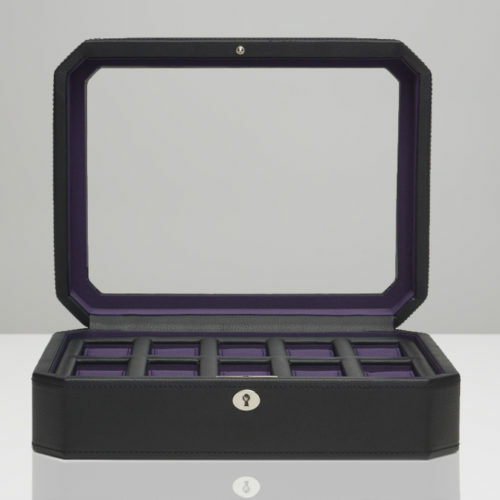 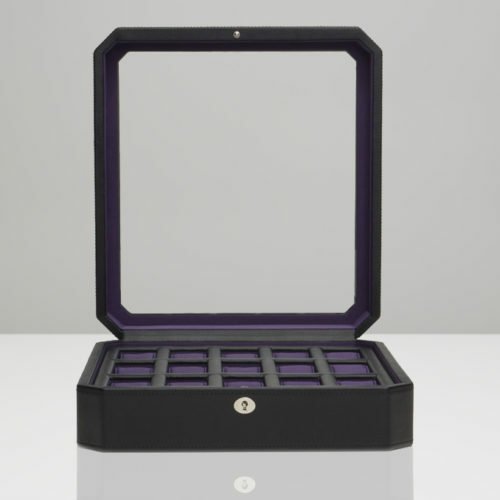 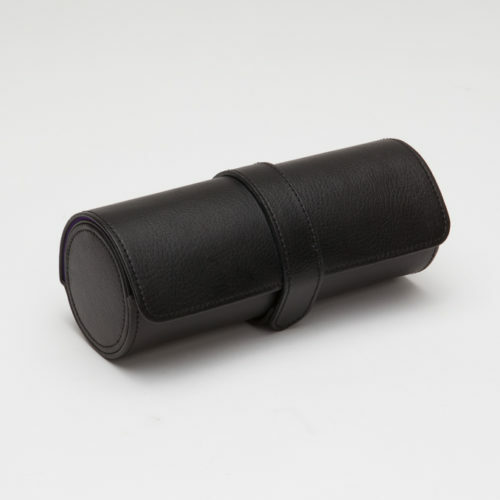 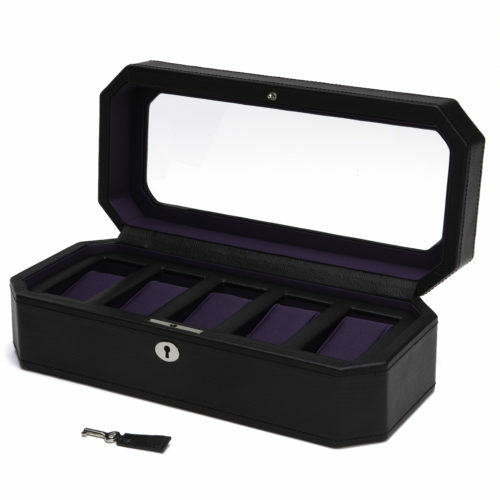 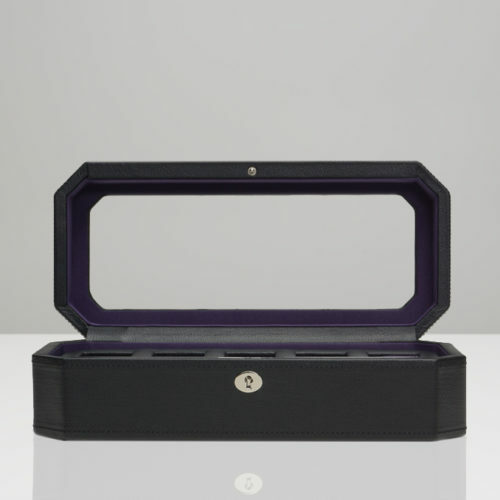 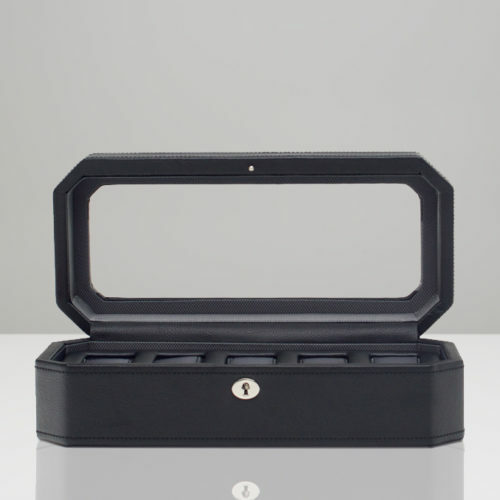 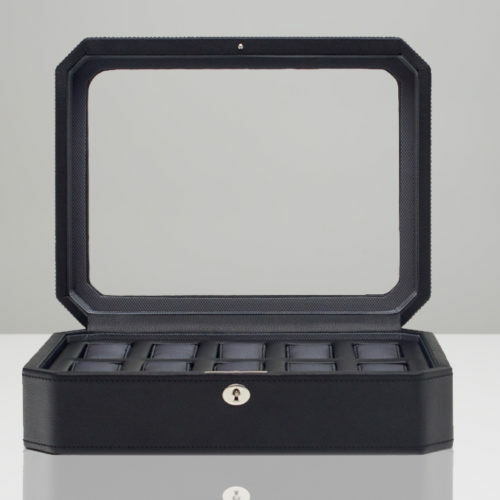 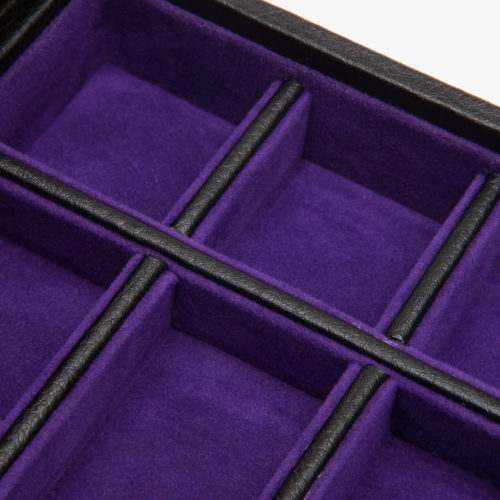 This black and purple watch storage box holds up to five quartz or mechanical watches, and is portable enough for home or away. 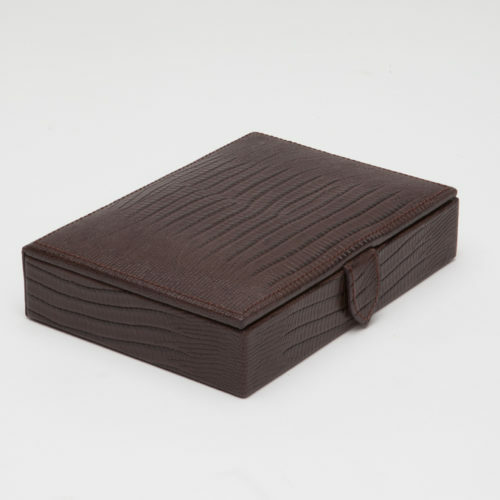 This item is made of a solid wood construction, encased in a new supple pebble textured material, and lined with a silver textured silk fabric. 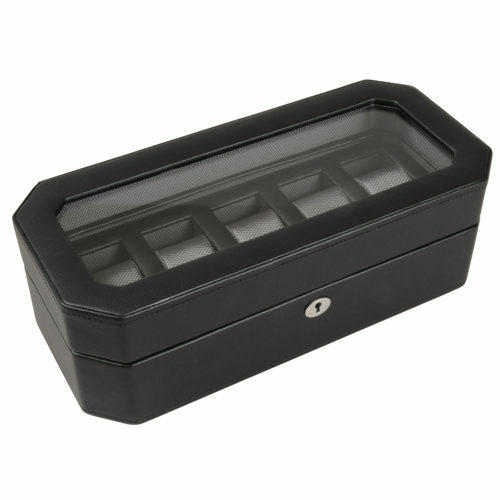 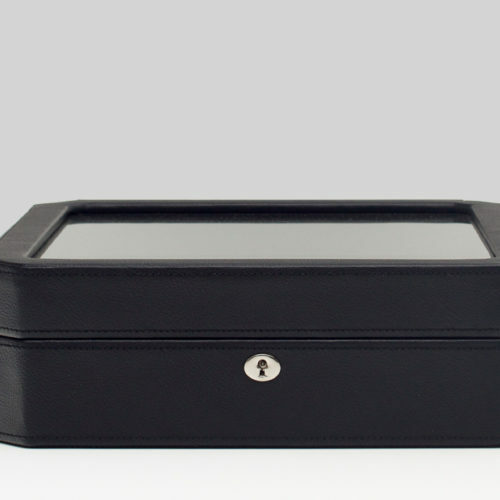 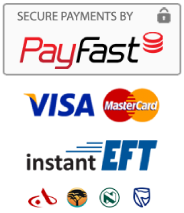 It has a sturdy see-through tempered glass lid and comes with a lock and key. 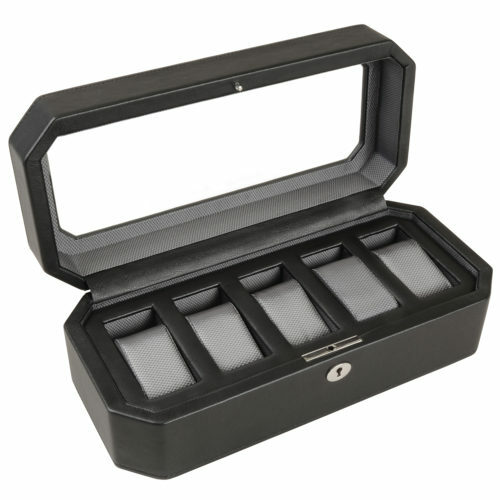 Holds up to five watches and, with 1.5″ (55mm) between each cuff, this compact yet spacious case can accommodate any size watch — even the largest 52mm case! 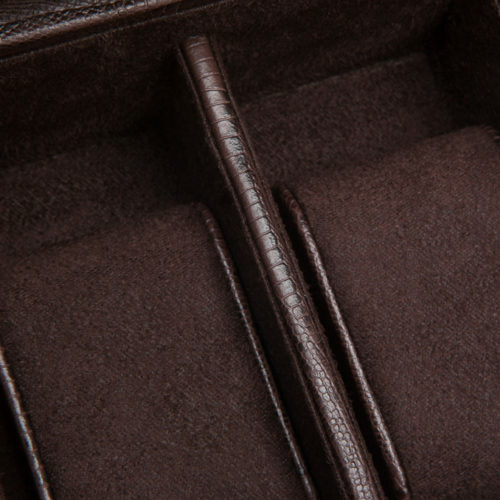 The Blake Collection represents the accessories intended for today’s dapper gentleman. Traditional with a contemporary flair, Blake makes a bold statement whilst protecting the manly things in life. 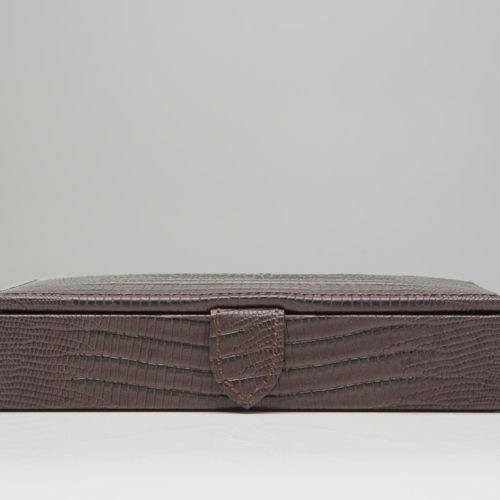 Beautifully crafted in either Teju lizard or pebble grain leather exterior, enjoy this stylish collection at home or on the go as it includes a valet, shoe shine kit, watch box, iPad case and more.This box can hold up to five timepieces and can accommodate any size watch in your collection. 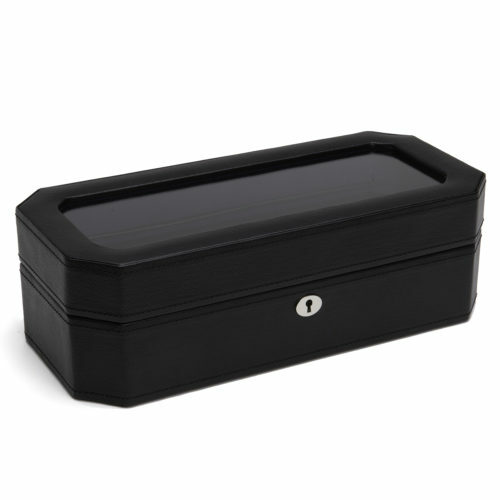 A mid-century inspired watch box, the Windsor combines sharp colors with smooth edges. 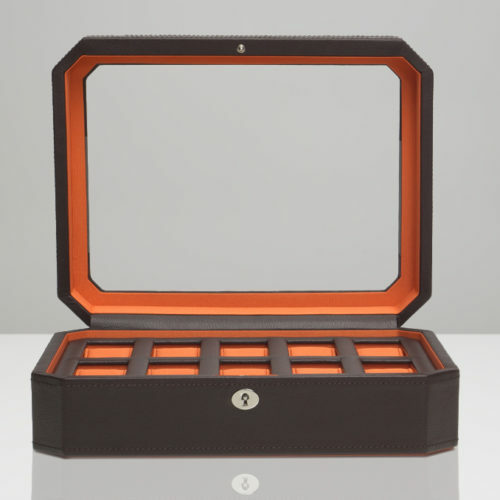 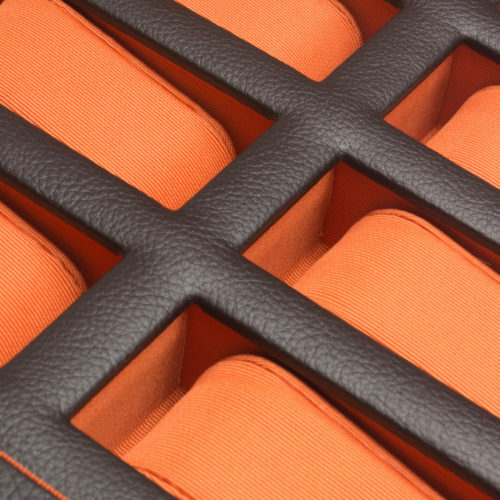 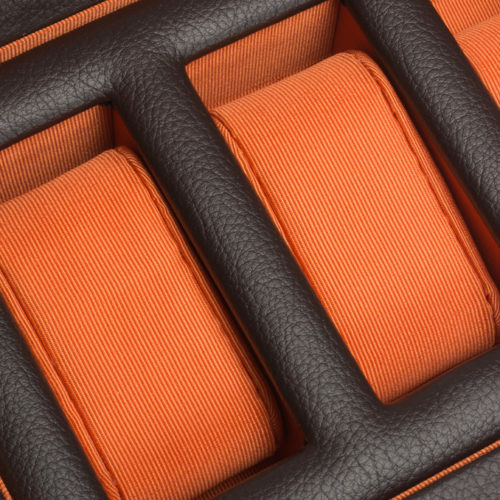 Includes chrome finished hardware, locking glass cover , brown pebble faux leather, orange textured silk lining and 15 piece watch storage. 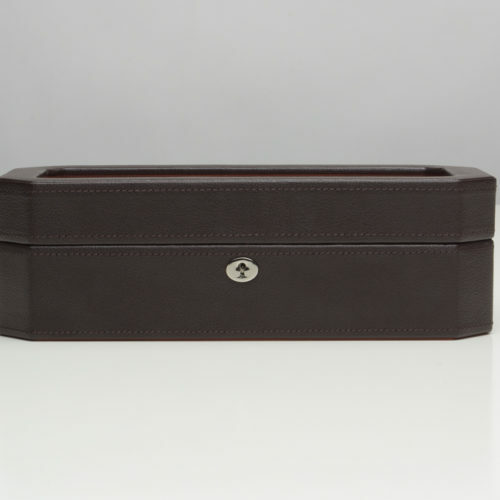 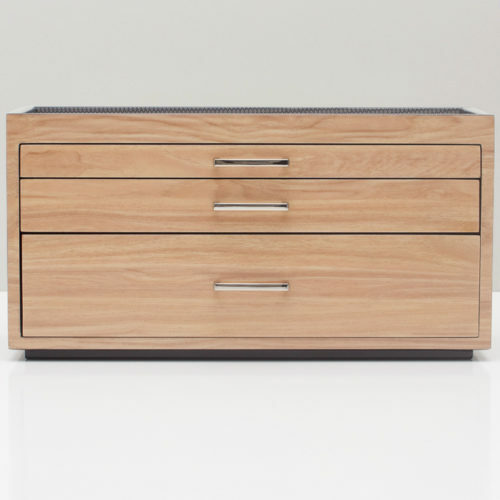 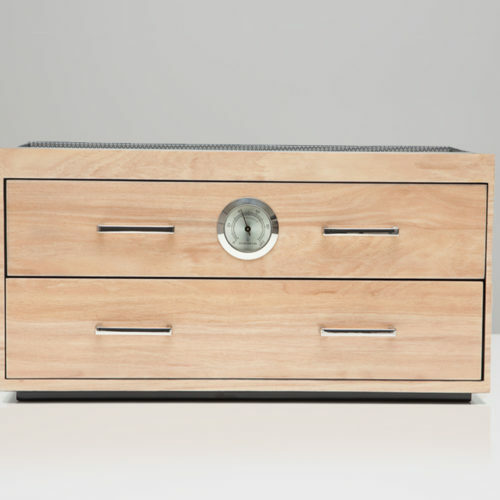 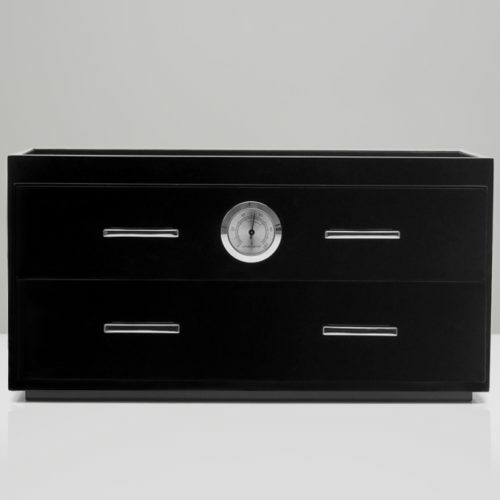 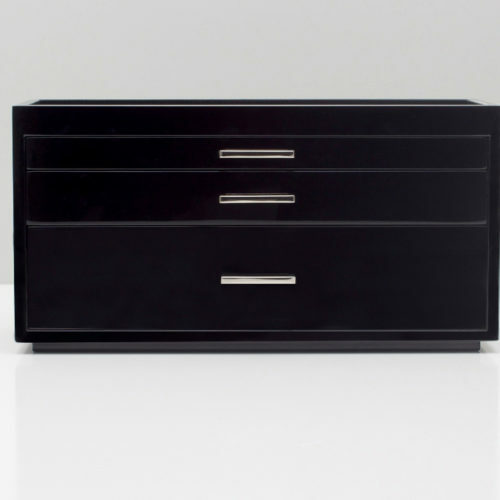 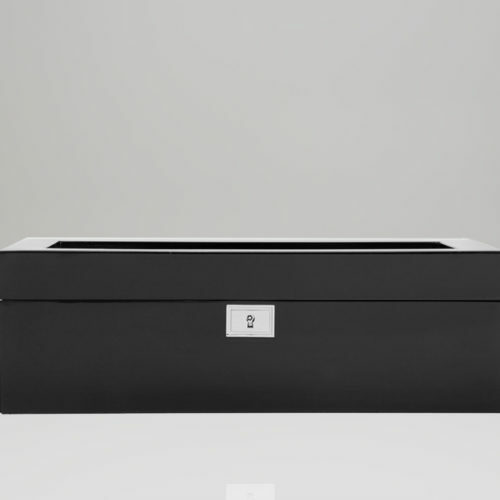 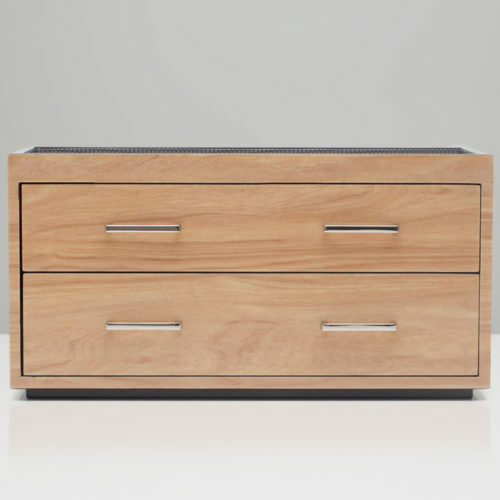 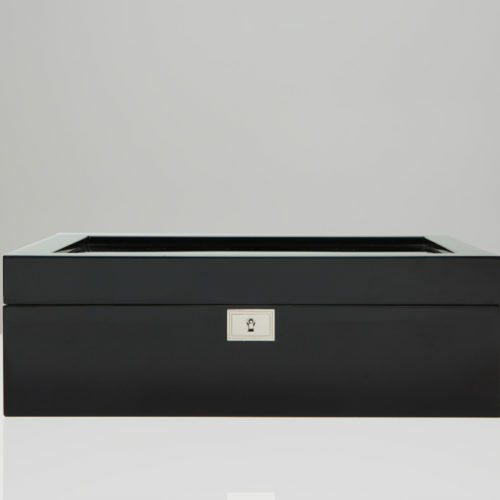 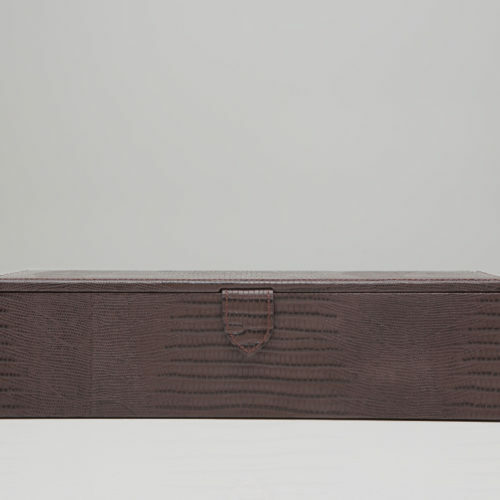 A mid-century inspired watch box, the Windsor combines sharp design with smooth edges. 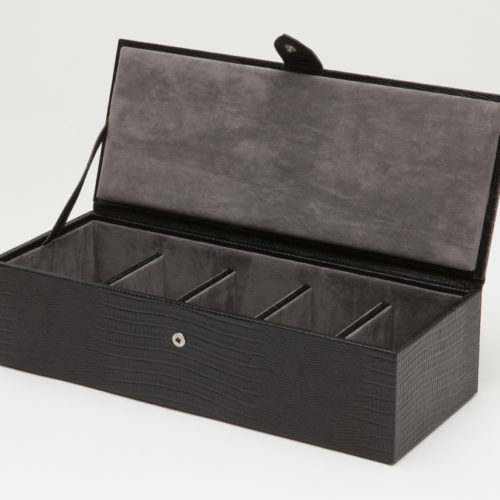 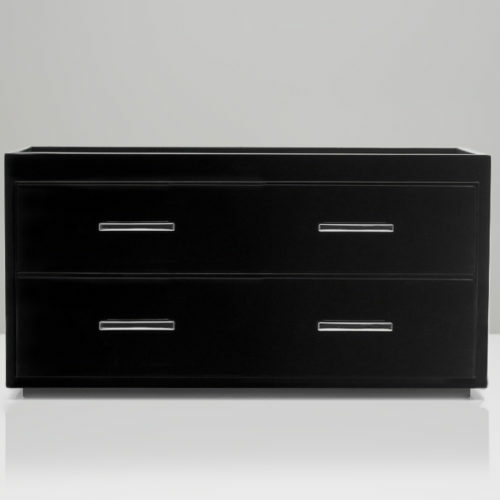 Includes chrome finished hardware, locking glass cover , black pebble faux leather, silver textured silk lining and 15 piece watch storage. 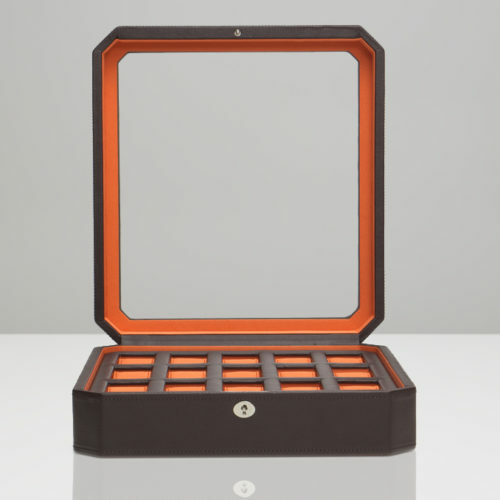 A mid-century inspired watch box, the Windsor combines sharp colors with smooth edges. 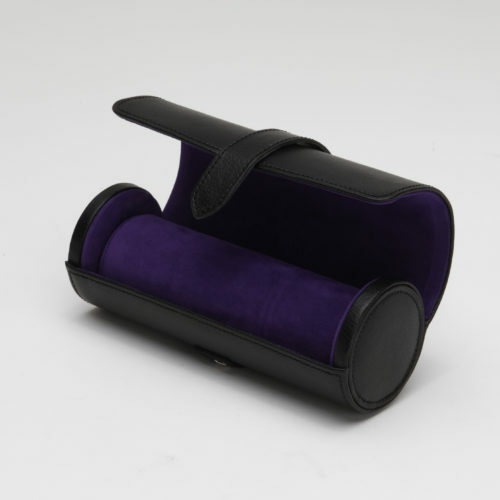 Includes chrome finished hardware, locking glass cover , black pebble faux leather, purple textured silk lining and 15 piece watch storage.